Google Nexus One – I Want! For the longest time, the only phone I wanted was the iPhone. At the end of last year, I swore that I would get my hands on the iPhone 3GS. No ifs or buts, I will find a way to get one before my birthday (I still have over two months). Then they released the Google Nexus One. Last week, the blogosphere was buzzing about the new Google phone. It’s Android-based. It’s Google. It’s perfect? Well, not quite, but it does seem to have so many things going for it, even when compared to the iPhone. Tech magazines online, bloggers, and practically everyone seem to be touting the Nexus One as the “real iPhone killer.” I don’t care, actually. I still want the iPhone (I am actually talking to someone who’s selling these babies) but the Google Nexus One just WON’T leave me alone. For what it’s worth, I have been reading a lot of complaints about the new release. It seems that the Nexus One has problems with getting a 3G signal. A lot of posters in forums claim that their 3G service is spotty. Worse, they do not know where to get help. Some go to T-Mobile, which is the “official” carrier while others go to HTC (the manufacturer). Both groups do not offer help, though, and point to Google, which supposedly is no help as well. How true is this? If the forum posters are to be believed, then it is very true. Then again, I was looking at the help/support forums – of course I shouldn’t expect many positive things there, right? 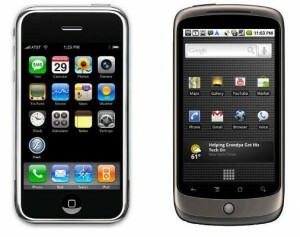 So, if I can only afford one, which should it be: Google Nexus One or iPhone? I want both!